Today is a great day to be a security enthusiastic since Zimperium kicked off the first ever penetration testing tournament. Avraham, a world-renowned white-hat hacker, in 2011. The Pentester’s World Cup is part of Zimperium’s efforts to increase awareness about mobile security, and simultaneously enhance the security of its range of award-winning products. You may recall Anti, The first comprehensive Penetration Testing software offered on Smartphones, Zimperium created a killer mobile app that is so simple to use, any technical person is able to perform pentest on his network to get status of which devices that are attached to the network are vulnerable, what ports are opened and additional information that is a must have for anyone who cares about the safety on his network. Last year at DEFCON, Avraham, also known as @ihackbanme, introduced the ethical-hacking tool, "Android Network Toolkit," dubbed Anti for short. At that time, it was in Beta, but now the new app is being released as Zimperium's ANTI, or zAnti for short. “We live in a dangerous mobile world today, and our goal is to significantly raise awareness about security and take steps toward securing our mobile future,” said Avraham. “***The World Cup also presents an opportunity for the world’s best hackers to challenge our products and make them better. We know of several companies that changed their network configuration because of ANTI, This allows us, the users to be safer. We're thrilled to know that ANTI raised security awareness! ***"
The winner will be awarded the “Black Card,” an entrance ticket worth $2,000 for the Black Hat event during July 25-26 and hotel accommodations in Las Vegas. The top 10 players will receive free Platinum, Gold or Silver accounts in zAnti. Top 10 researchers will receive T-shirts and wristbands to enter Zimperium’s closed event at the Las Vegas Black Hat event. Researchers who find a bug and report it to Zimperium will receive 500 points and a cool zAnti t-Shirt.- The reported glitch will affect the score of every participant who used it - a hacker's duel! The World Cup ends July 16.
zAnti can be downloaded directly here. 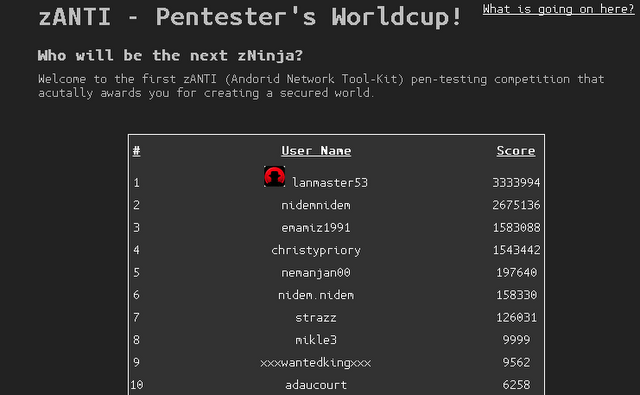 Keep an eye on the Pentester's World Cup Leaderboard. May the best hacker win! Zimperium Ltd. is a privately owned mobile security software start-up located in Tel Aviv, Israel. The company was founded in 2011 by Itzhak “Zuk” Avraham, a highly regarded security researcher. Zimperium has set for itself a simple goal: Ensure world-class mobile security for enterprises, governments and mobile carriers. Starting out with a team of nine Ninjas using their collective Zen, Zimperium has created multiple products that secure our mobile environment against targeted hacking attempts (APT) or widespread threats (Worms) with very neat 0day protection features.